Visit this link to see teenaged Yesudas singing at Vijayarajan Master’s school. Later I went to Chennai and there I learned Music under the guidance of Sri. P.S.Thyagarajan at Mylapore. Here I learnt Navavarana Krithis and other famous Deekshithar and Thyagaraja Krithis. Smt. Radhamoni Natarajan -residing at Coimbatore also taught me lessons on Vocal Music. Started learning Veena at the age of 15 under the guidance of Sri. A. Remani- residing at Tripunithura. Other teachers who taught lessons on Veena include Smt. Jayalakshmi Suresh- (Retired HOD-Music Dept.Maharajas College EKM) , Smt. Chithra Subramaniam-Kochi, Smt. Gomathi Chidambaram-Trivandrum Dr. Padma Varma of RLV Music College Tripunithura. It was a turning point when I met Smt. 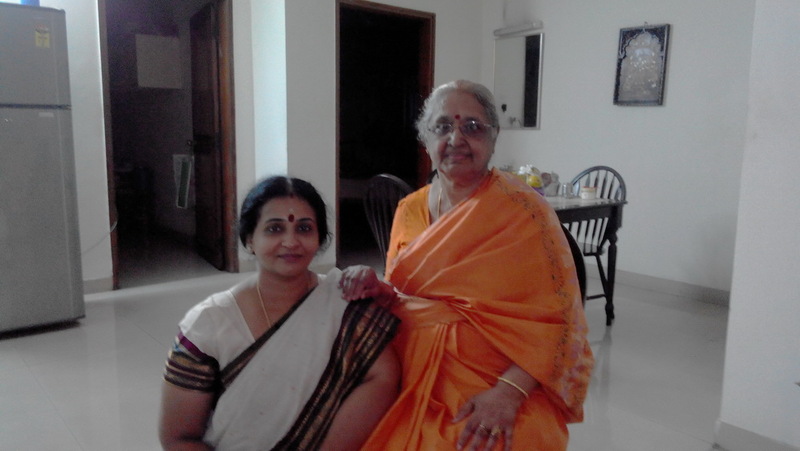 Seetha Balakrishnan-Coimbatore – a disciple of Sri Trivandrum Venkatraman who had taught me several krithis. At Chennai I was blessed to study under the tutelage of Smt-Rajeswari Padmanabhan – Kalakshethra, who was an exemplary musician and a superb human being. She taught me several krithis composed by Tyagaraja, Dikshithar and other great composers. Now continuing the lessons on Veena under the tutelage of Sri. A. Ananthapadmanabhan – Trichur. I owe all my achievements till today to the Gurus who had taught me and still teaching me and to the bountiful blessings of my Parents and Almighty. You are most welcome to my Blog. Your can use the article on Chakra and Saptaswaras. Kindly sent me a copy of the souvenier you have published on your Thyagaraja Aradhana Celebrations by email . Pls. keep visiting as i will be posting more articles on this aspect. I am happy that this blog is of use to you. Welcome to my blog and have a happy stay. Thank you very much for the compliments. My knowledge is just a fist full of water when compared to the ocean which i do not know. My salutations at the lotus feet of my parents who had guided me in the right direction at the right age and to all my gurus who had made this possible amd also to the God Almighty. My first Guru Sri. Hariharan Master is residing in Coimbatore. I will sent his details in your mail id. He has dedicated his life to Music and has specialised in teaching Violin. He is a professional violinist. He also takes Vocal classes. Whatever I am today its because of his blessings. I am extremely happy to find the photo & mention on the internet of my first guru Sri PS Thyagarajan . I was just trying to see if anyone has uploaded any of his teachings. God bless you. I would like to convey my Namaskarams to guruvu Garu through this mail. I am Suresh Chandran from Mumbai.I am very much interested in learning carnatic vocal. could you kindly suggest a few teachers in Mumbai ? I do not know anyone in Mumbai. My connection with Mumbai is limited to the extent of hearing a lot of music by Bombay Sisters.. Welcome Mr. Natarajan to this blog. It is better you search for a teacher in your own locality as in the initial stages of learning music, it is always better to learn 2 days a week directly sitting in front of a Guru. The initial stages of learning needs a lot of supervision by the guru with regards to the sruthi concept, talam , etc of the student. Though I didn’t get Guru till now, MS Amma is my Manasika Guru. I think no one can reach her place. What a feel of devotion in all her songs…. Chanceless. I am blessed that I God made me to feel her as my Manasika Guru. You too pray that I should learn nicely and sing atleast for myself. You are one of my mentors in our music. Thank you mam! My name is jayanthisiddi, Iam from Hyderabad, andhraparadesh. Now Iam in Germany , me and my daughter who is 6 yrs old wanted to learn Carnatic music online, can you teach us online music? So Pls suggest me . I will sent you a mail..
what age is ideal for children to start training in music? Do you know someone teaching music in and around Kakkanad ? I recommend atleast 7 years of age or 2nd standard when the child is able to read and comprehend language. I do not know any teacher taking classes in Kakkanad. It was great pleasure for me to read your blogs. You are doing excellent job by sharing your knowledge on carnatic music. If you have any cotacts, Could you please suggest any GURU for learning carnatic vocal music in Bangalore. I do not personally know anyone taking classes in Bangalore..
Seetha Balaksrishnan takes Veena Classes and not vocal. By the way whose number is this ? Your number or Seetha Mami’s number ? Hello anuradha madam, its pleasure to reading your blog. Lot of informations on carnatic music.I am Mrs lalitha bharathi residing in chennai in kodambakam.. I started learning music from my age of 4 . i have learnt from various Gurus in mumbai,bangalore in my young days. Now also i am learning from Mrs radha sridhar . As it is an ocean still to learn a lot. .
Do you conduct any Carnatic music / Veena classes online, can you please teach me veena online? Pls suggest . Mam…..vanakkam……can you pl..tell me any veena teacher in Coimbatore pl.. Right now I do not know anybody in Coimbatore. My teacher Smt. Seetha Balakkrishnan was residing there. But now she has shifted elsewhere.. I had learnt veena from Smt.seetha Balakrishnan in Coimbatore, but now I am in Mumbai, a teacher my self. Do you have any contact details of madam, as I would like to contact her. Happy to see another disciple of Seetha Mami. I do not have contact details. I know that she is in Bangalore. I am also searching for her contact details. Definitely will let you know when I get it. My name is Hanson, working in Bangalore. I have learned carnatic music for almost 6 years in Kerala (15 years back). Now , i would like to continue my learning and i have been searching for a guru in bangalore. I think now i found 🙂 . I guess you are in Bangalore and would like to learn music under your guidance. Would you please let me know your convenience and details. I do not reside in Bangalore. I live in Kerala..
My name is Mrs. Malathibabu residing here by coimbatore, i would like to learn carnatic vocal music and to learn veenai too I know little bit of knowledge about of carnatic music and Veenai .. can you pls suggest me carnatic gurus at coimbatore who have dedicated their life for music, iam asking this because i have contacted some music schools, but they are working and teaching music as part time, so pls suggest me madam!! I do not know personally any vocal/veena teacher in Coimbatore. Earlier my Veena Guru Smt.Seetha Balakrishnan was residing there. But now she is not there. You can search on the web for the same..
My name is Chidambaram, presently staying in Chennai am a rasika of carnatic classical music. My wife and daughter learnt music from Smt.Sakuntala Seshadri, a well known teacher at Arumbakkam, Chennai and my wife is presently teaching basics at the school being rub bthe afore said guru. I found your blog immensely interesting and am following it regularly. I wish you continue the good work for many years to come. Thank you Sri.Chidambaram for visiting this blog on Music and posting your comments. Very happy to note that its useful for music enthusiasts. Hai mami, namaskaram, I am easwari, all the way from India, I am an ardent fan of classical music, I have learnt till a certain level, and I have been thirsty to continue, but there are no teachers here in Malaysia, that would spare time individually. I am eager to learn and improve my self. Do you teach via skype? Anuradha Ji, I am sorry I did not kow where to post a questions. I posted in one of your reply. I have a 15 yeare old daughter., She wants learn & sing carnatice. She is learning carnatice for last 5 years. She is very slow in picking up new ragams & Kritis. She learns over phone. Please advise what can I do to help her. If she is learning online, she can very well use skype rather than phone. A vision of the Guru singing will definitely help the child to notice the talam and other aspects of singing. In addition to learning, she has to listen to lots of music so that in course of time that will get registered in her mind and it really pops out automatically when she sings. Make sure she practices everyday at least for one hour whatever she has learned starting with a varnam. Varnam has to be sung in two speeds and let her choose 3-4 krithis from her lessons and perfect it by repeated singing.. Thanks a lot Anuradha JI. I love your website, there is a wealth of information. Our teacher thinks SKYPE slows down…. I will ask her to practice, as per your suggestions. I liked your post about Brigha’s today. I will ask her to practice. She practices in only fast speed. YOu have mentioned it should be practiced in 4 speed. I will make sure she does that too! Hai mam, i love singing since my childhood but my mom and dad hate my singing. Now i would like to become a student of you. Please accept this small request mam. Mam, I am Radha from cbe. My son is 8 years old. He is interested in music and mridangam. Pl suggest a good music teacher in cbe. Hello sir,I am interested in learning western music.can you suggest me any vocal teacher in coimbatore??? Nice meeting you through this blog. My kid wants to learn Vocal Music. I was searching for a long time. Can you suggest me anyone in Coimbatore. R u residing in chennai. I am immense love with music but 27 year old, never got chance to learn yet. I really wanna learn carnatic. Can you take class or suggest some one in chennai who willing to take class for 27 year adult. T.Nagar Area. Age is never a problem. Actually it is better late than never. i want to know how to sing the sangathis effectively, some sangathis are slipping when i sing and i am not able to rectify them, please help. i would like to learn violin. can i get classes through any master over there. pls reply . I liked your blog, especially the way you portrayed your gurus brings a lot of respect to them and you. contact no: 08025551404 hope that helps. please search my blog. I have posted the details already..
Hi Mam, I am looking for violin teacher in Coimbatore. Can u suggest someone ,mam. Please search Guru in my blog in the header “Search My Blog” located at the right hand side column. Namaskaram, I have learnt carnatic music when I was younger and have since lost touch. I would love to start learning again. Could you kindly suggest the name of a guru in Mumbai? Thank you. Dear Anuradhaji! My name is Visalam. I am in Coimbatore. I have learnt vocal as well as Veena for more than 20 years.even today,I play Veena daily. Now I want a proper Guru for my further learning in Veena. Do you know anybody in Coimbatore,or you take classes on Skype? Seetha Mami takes veena class through Skype. Tell her that I have directed you to her. I am interested in learning violin. Could you please suggest me some good teachers in coimbtore city. hii..im shashikant from mumbai…im 23yrs old….and never learnt music…but now really want to learn…is it possible for me to start from now..?? ?and if yes then pls suggest someone for me?.?? Read all your messages. Please note that I’m busy with several projects and hence cannot post an immediate reply to all visitors questions. Secondly, I would suggest you to read all the comments in all the pages where these questions are answered several times. I do not personally know anybody in Mumbai who teaches Carnatic Music. But definitely there will be many taking classes. So please search in your area or in the web. There is no specific agelimit for learning music. Anybody can learn at anytime. I have been listening to veena instrument recitals recently. I had learned vocal music for very short period of time before 18 years. Now i wanted to learn veena instrument just to know more about the music and instrument. I am 33 years old. Can i learn it ? Are you taking any classes in Cochin? Or can you suggest me any good teacher in Cochin who take veena classes? Please note that there is no age limit for learning any art form , especially music. Your wish or desire must be fuelled with intense passion and determination to pursue learning. Such art forms are named as FINEARTS mainly because they REFINE YOUR HEART AND MAKE IT PURE, TAKING YOU NEAR TO GOD. I am taking classes at Kochi and now suspended for a period of 3 weeks due to summer vacation. Shall inform you once I resume classes. Kindly send me a mail at anuradha7.mahesh@gmail.com, so that I can send you a mail, once I start classes. Hai mam i am ramyakarthikeyan from coimbatore i am interested to learn veena.can u help me …in any way.? Am looking for my daughters Shreya Suresh for Carnatic music. She has been learning since seven years. As we have shifted to Chennai, am unable to find a tutor for her. Chennai is the seat of Music. Definitely you will find lot of Gurus there. Kindly google,. Am Sridhar actually working in flora events .We are looking for carnatic singer for an vip’ s marriage .i wanna tell it detail .Can u give your contact details mam. Can you please refer a Violin Guru for home tuition? As of now I do not know any one in Chennai as I’m living in Kerala now. But there are many musicians in Chennai. Please google. Please click the link below and fill the form in that page.